Summary of (M1840) Toilet Transferring: OASIS C1 - Current ability to get to and from the toilet or bedside commode safely and transfer on and off toilet/commode. 0 - Able to get to and from the toilet and transfer independently with or without a device. 1 - When reminded, assisted, or supervised by another person, able to get to and from the toilet and transfer. 2 - Unable to get to and from the toilet but is able to use a bedside commode (with or without assistance). 3 - Unable to get to and from the toilet or bedside commode but is able to use a bedpan/urinal independently. 4 - Is totally dependent in toileting. 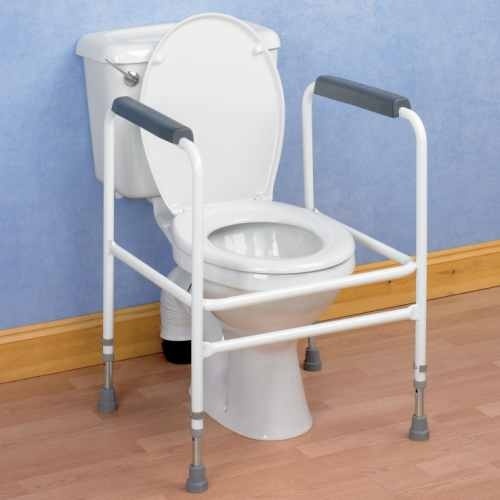 Identifies the patient’s ability to safely get to and from and transfer on and off the toilet or bedside commode. environmental barriers (for example, stairs, narrow doorways, location of toilet or bedside commode). Excludes personal hygiene and management of clothing when toileting. The patient’s ability may change as the patient’s condition improves or declines, as medical restrictions are imposed or lifted, or as the environment is modified. The clinician must consider what the patient is able to do on the day of the assessment. If ability varies over time, enter the response describing the patient’s ability more than 50% of the time period under consideration. The toilet transferring scale presents the most optimal level first, then proceeds to less optimal toileting methods. Read each response carefully to determine which one best describes what the patient is able to do. If the patient can get to and from the toilet during the day independently, but uses the commode at night for convenience, enter Response 0. If the patient requires standby assistance to get to and from the toilet safely or requires verbal cueing/reminders, enter Response 1. If the patient needs assistance getting to/from the toilet or with toileting transfer or both, then Response 1 is the best option. If the patient can independently get to the toilet, but requires assistance to get on and off the toilet, enter Response 1. A patient who is unable to get to/from the toilet or bedside commode, but is able to place and remove a bedpan/urinal independently, enter Response 3. This is the best response whether or not a patient requires assistance to empty the bedpan/urinal. In the absence of a toilet in the home, the assessing clinician would need to determine if the patient is able to use a bedside commode (Response 2), or if unable to use a bedside commode, if he is able to use a bedpan/urinal independently (Response 3). If the patient is not able to use the bedside commode or bedpan/urinal as defined in the responses, or if such equipment is not present in the home to allow assessment, then Response 4 – totally dependent in toileting would be appropriate. Assessment Strategies: A combined observation/interview approach with the patient or caregiver is helpful in determining the most accurate response for this item. Ask the patient if he/she has any difficulty getting to and from the toilet or bedside commode. Observe the patient during transfer and ambulation to determine if the patient has difficulty with balance, strength, dexterity, pain, etc. Determine the level of assistance needed by the patient to safely get on and off the toilet or commode. Tasks related to personal hygiene and management of clothing are not considered when responding to this item.